Fujitsu's FLEPia is the world's first colour electronic book. Fans of electronic paper who have a few thousand pounds to spare should be getting pretty excited right about now. That's because Fujitsu has just announced that the world's first colour e-paper electronic book is available from October ... at a price. For ¥1,575,000 (£6,630), interested parties will be able to secure a lot of ten A5 size units of Fujitsu's FLEPia e-book for testing and possibly sample marketing. The Wi-Fi-toting device also comes in an even more expensive A4 size. The FLEPia's big selling point is, of course, going to be its ability to display up to 4,096 colours on its 768 x 1024-pixel screen. Realistically, that's more likely to be used in eight-colour mode, as the higher setting takes ten seconds to refresh each page. The timing, which is the equivalent of turning a page in a paper book, is reduced to two seconds at the lower colour setting. Although Fujitsu's press photograph you see above isn't exactly flattering, the hardware in the device is actually rather attractive. Running Japanese Windows CE 5.0 (not Windows Mobile), the 12mm thick FLEPia is powered by an Intel XScale processor and weighs either 320g (A5 model) or 480g (A4). Wi-Fi is of the b/g variety and storage is provided courtesy of an SD card slot. 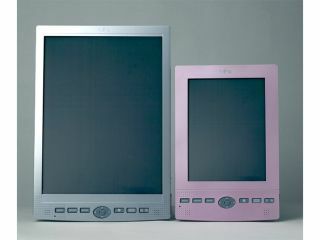 The screen, which is touch-sensitive, can be used to display websites and for composing emails using an onscreen keyboard and stylus. Naturally, there's a stereo speaker and a headphone jack for listening to any audio content on the SD card and the battery is rated at 50 hours. Once the price and weight come down and the refresh rates improve for this kind of technology, there's little doubt e-books like the FLEPia will take off - that's providing content isn't restricted to DRM-protected material only.